Currently the largest available western exposure site on a wide water cove in aqualane shores. Superior location, size and setting. ***** nearly one-half acre, preferred rectangular lot, 100 feet of water frontage, plus up to 190 feet of depth will proportionately accommodate your waterfront estate. *****direct gulf access through the preferable gordon pass, free of any bridges along the way. *****enjoy the sunsets and holiday fireworks on the beach from the privacy of your lanai. As flamingo coves wide water welcomes large boats, you are ready to go with 80 linear feet of dock plus large cut-in boat lift. *****your family & guests will enjoy the mahogany tree lined walk of less than 25 houses to the beach, or stroll to third street souths renowned array of shops & restaurants. *****purchase this location today, and take your time envisioning your ultimate tropical dream home then choose the best builder for your choice. *****great homes always begin with great sites. C. 15203 - feel like youre on a luxury cruise right in your own home! This 17th floor luxe re-mastered beachfront jewel offers a penthouse-level of classy interior naturally burnished finishes and appointments. Enjoy exquisite panoramic sunrise-to-sunset views from your generous sw glass-railed gulf front open lanai, a lavish open chefs dream kitchen, plus a dreamy gulf front master retreat touting private gulf vistas, sumptuous master bath and his and her custom walk-in closets. The en-suite guest bedroom and den/family room both enjoy sharing a sunrise easterly screened lanai with yet more pristine and dramatic views. This brilliant gem is seldom found! Enjoy the prestige of a world class menu of both bay colony and pelican bay included membership privileges: 3 private beachfront dining clubs located on 2 miles of pristine sugar white sandy beach, attended beachfront services, 3 active tennis clubs, miles of nature walking and bike paths, state-of-the-art fitness, and community lifelong learning and wellness center. Artis center for performing arts, mercato, and waterside shops all just steps away. H. 14082 - best value in aqualane shores. Extensively remodeled old florida home with a zen garden influence both inside and out. Located on the idyllic tree-canopied 18th avenue south in aqualane shores and duck channel, includes dock and boat lift. Enjoy features including bamboo flooring, updated kitchen and bathrooms, whole house generator with 500-gallon propane tank, or transform this perfect aqualane shores32-acre homesite into your new construction masterpiece. The gulf of mexico is minutes away by boat or a brief walk down the street, and the shops and restaurants on third street are also a short walk away. The unique, expansive private backyard is a must-see. The property affords adequate room to easily add another bedroom and bath if desired. C. 15880 - rarely available penthouse! Only one of three penthouses in beach house at naples cay. This 33 unit intimate boutique style building is literally just steps to the beach! Listen to the waves rolling onto the sand. Spectacular never ending gulf views and sunsets! Beach house ph-01 offers a private rooftop terrace, cathedral ceilings in the living/dining areas, custom mirrors and wood trim in the living room, marble flooring throughout, and a built in wood bookcase to the ceiling in the living/dining area. Freshly painted throughout as well as the marble floors having been polished and sealed throughout. Two deeded garage spaces. Pet friendly building, allowing up to two dogs up to 15 in height to the shoulders. New a/c installed feb. 2019, and newer water heater. Naples cay is nestled between park shore and pelican bay, a hidden jewel of a community offering a unique level of privacy and tranquility, yet is within walking distance to fine dining, shopping and entertainment to venetian village, waterside shops and artis-naples. Unique opportunity for buy & hold or immediate redevelopment investment in the heart of the olde naples district, bordering aqualane shores. 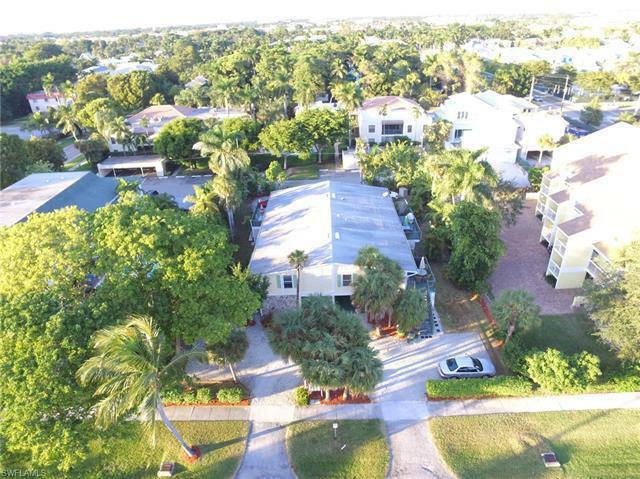 Large 100'x151 lot with existing rental income producing condominium association in an unrivaled location between 5th ave. And 3rd st. And within walking distance to everything downtown naples has to offer! A large parcel with 15,100 sq ft that can be redeveloped into 1 or 2 large single family homes, 3 townhomes or 4 condos! This parcel is zoned r3t-12, which allows unique transient rental opportunities for downtown naples. It can be sold in bulk (100'x151); or, be re-plat into two separate parcels (50x151 each) and sold separately. Current owners have worked with the city of naples, various architects and contractors in town on all building possibilities. Sample plans, as well as estimated building costs from local top contractors in hand and can be shown to potential serious buyers. Presently all rentals units are generating almost $72k gross yearly. Please contact listing agent!